“Try not to worry.” “Stop worrying!” “Why don’t you just relax?” Such advice rarely provides any relief. It’s always difficult—and at times impossible—to stop worrying. Worrying is a common response when we encounter situations that we care deeply about. It can even be productive, as worrying can lead to increased focus, motivation, and action that can resolve problems. But worrying about too many things at once is often counterproductive. Anxiety can be a result of worrying about multiple subjects. You might find it hard to concentrate, feel restless, develop physical ailments, or have trouble sleeping. While you might not be able to stop worrying altogether, you can try focusing on a few worries at a time. A simple do-it-yourself intervention can help you to prioritize your worries, which can ease your anxiety. 1) Gather a pen or marker and several small pieces of paper. You can use index cards, Post-its, or scraps of paper. 2) Write one worry on each piece of paper. Focus on your main worries—the things you cannot stop thinking about right now. Resist the urge to get all your thoughts down on paper now and just keep it simple, such as writing someone’s name or the name of an upcoming event (for example, “Credit Card Bill,” “Seeing In-Laws at Thanksgiving,” “Peter,” “Doctor’s Appointment,” “The Big Work Project”). There is no right number of cards to use. It depends on how many significant worries you have. 3) Place your new worry cards face up so you can see all your worries together. Pick a place to display them where they won’t be disturbed and you can see them easily—maybe pinned to a bulletin board or taped to a wall. If you prefer not to have them visible to others, you can carry them with you. 4) Sort the worries using a specific timeframe. Ask yourself: Which of these do I need to worry about for the remainder of the day (or in the next two hours, or this week)? Which can I put aside for now and come back to later? Try to choose no more than three worries to focus on. 5) Keep the cards identifying the chosen worries face up and turn all the others over, exposing their blank back sides. You are not forgetting about these other worries, as they are no less important. Instead, you are putting them aside for now in order to focus on the time-sensitive worries. 6) Give yourself permission to focus on the worries you have chosen. If you start thinking about the other worries, just remind yourself that you’ll come back to them when it’s time. Use your worry cards as a visual reminder of which worries you are focusing on and which you are not. 7) Reprioritize as often as you need to by turning different worry cards face up or face down. If another worry becomes more immediate, turn that card face up. If a worry is face up but you realize it’s not time-sensitive, then turn it over. Add cards for new worries as needed and discard any that have been resolved or that are rarely or never turned face up. Some people choose to revise their cards throughout the day, once a day, or once a week. Follow your instincts to decide what’s best for you. The purpose of this intervention is to help you focus your worrying on a select few topics, which may help you to manage anxiety. After a while, you may find that you no longer need to use these cards, as you’ll get used to focusing on only a few worries at a time. Do you feel overwhelmed by multiple worries? 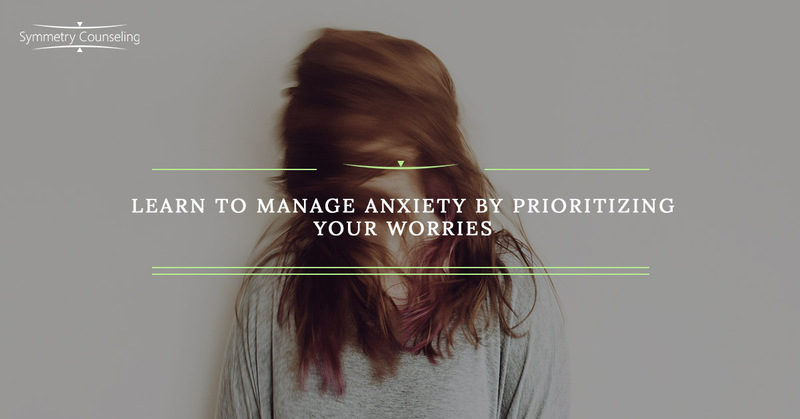 For more guidance on how to manage worrying and anxiety, contact Symmetry Counseling today.